Aventine is one of the Seven Hills of Rome lying to the east of the Tiber River. Some say the hill was named for the birds that nested there. 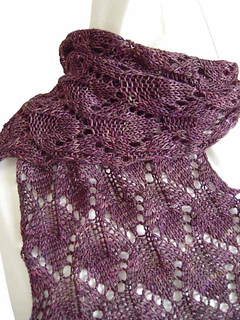 This little scarf shares the name Aventine, because its delicate stitch reminds me of a flock of birds in flight. Construction: Pattern is worked from the cast on straight through to the bind off edge. The yarn overs give it pleasing points on both ends and along the sides. The combination of knit and purl stitches on every row keeps it from curling at the edges, and gives it a nice texture. 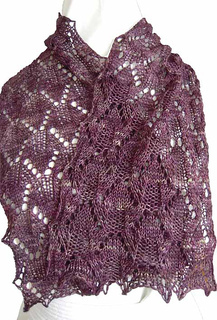 Sizes: Pattern written in 3 sizes: narrow scarf, wide scarf, and shawl. Stitch instructions: Written and charted. Errata: The chart in the magazine is wrong. Unfortunately, something happened to the chart between being sent to the publisher, and being printed. If you have the magazine, and want to knit this from the chart, please contact me.